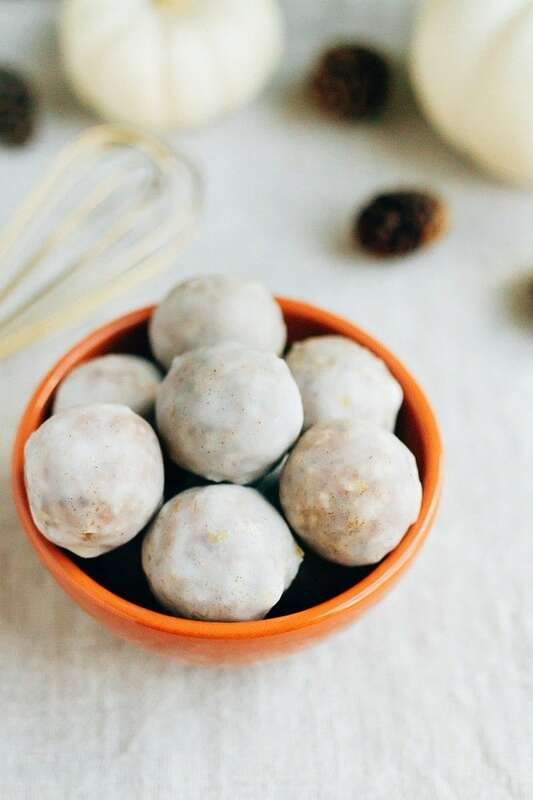 These no bake healthy pumpkin spice donut holes are packed full of pumpkin spice flavor and covered in a coconut maple glaze. Vegan, gluten-free and absolutely delicious. 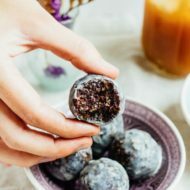 A few weeks ago I posted these no bake blueberry muffin donut holes. Everyone LOVED them and I quickly decided a fall version needed to happen ASAP. I thought about making an apple pie version, but ultimately went the pumpkin spice route. The pumpkin lover in me couldn’t resist. 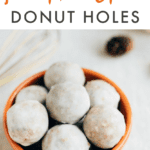 A little experimenting happened in the kitchen and before I knew it I was packing up a container of these pumpkin spice donut holes as a road-trip snack for our drive to New York. It’s funny because I’ve found that I do my best recipe testing right before traveling. I know I should be packing my suitcase with clothes and such, but instead I always find myself in the kitchen. I’ll be frantically cooking and baking (usually trying to use up perishable items I don’t want to go to waste), packing snacks OR cleaning the kitchen because I hate leaving a messy kitchen. The messy kitchen thing is a post for another day, but in a nut shell I literally can’t leave the house if there are dishes in the sink. It’s a thing! 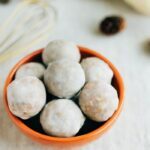 Speaking of healthy snacks… these donut holes sound and look decadent, but they’re super healthy! 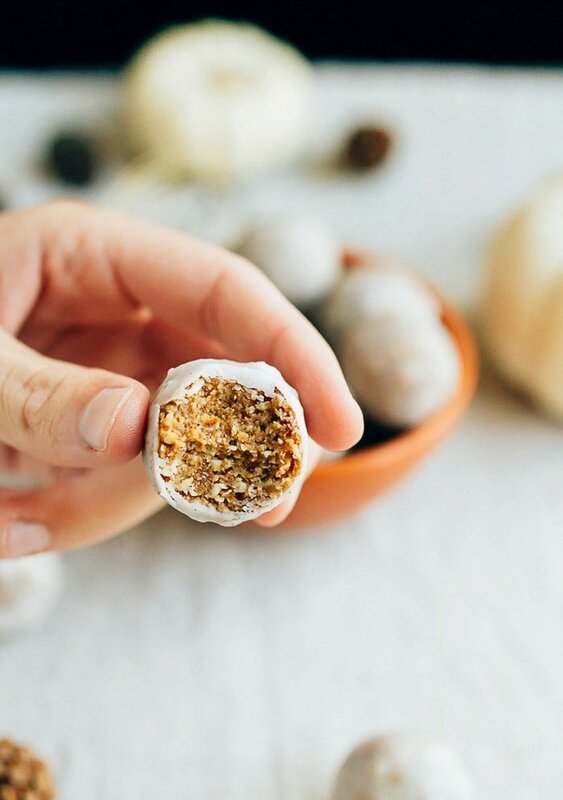 They’re the perfect mix of sweet dates, rich cashews and coconut, doughy oats and pumpkin spice fall flavor. I can’t get enough. I really don’t want to play favorites, but I think I might like these pumpkin spice donut holes better than the blueberry muffin donut holes. And I loved the blueberry soo that’s saying something. The best part about these babies? They’re super easy to whip up and you only need 10 ingredients! You start with a simple base of dates, cashews, oats, protein powder, pumpkin pie spice and a little sea salt. Process the mixture, roll into balls, freeze and then you’re ready to dip them in the glaze. Coating with the holes with the coconut maple glaze is the most time consuming part of the whole recipe, but it’s also the fun part! While coating the holes you can set them on parchment paper or use a wire rack with parchment underneath. The wire rack helps to ensure the glaze drips off rather than pooling at the bottom of the donut hole and creating a little pedestal. I don’t mind the coconut pedestal, but the balls look more like a donut hole without it! I hope you love these little holes as much as we do! Enjoy. 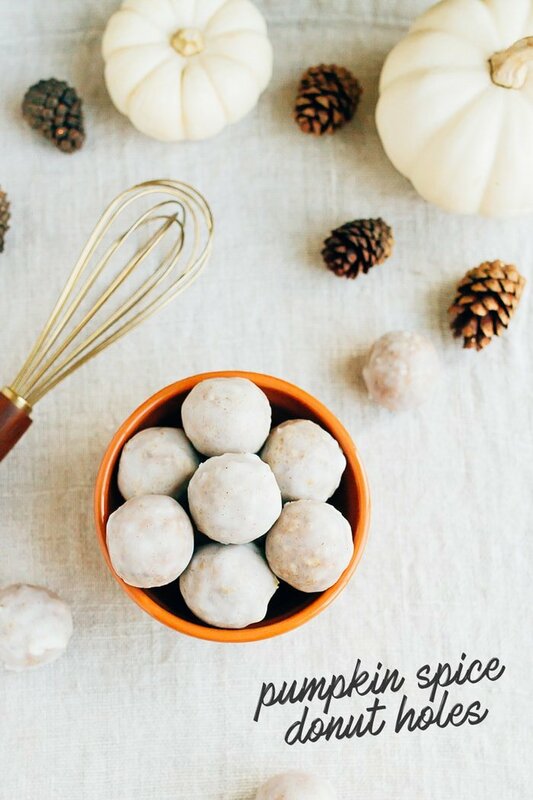 If you make this healthy pumpkin spice donut holes be sure to leave a comment and star rating below letting us know how it turned out. Feel free to post a photo on social media and tag @eatingbirdfood. Your feedback is so helpful for the EBF team and our readers! 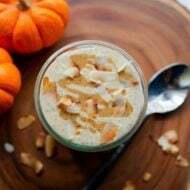 Add cashews, dates, oats, protein powder, pumpkin pie spice and sea salt into your food processor and pulse until mixture is completely chopped. Open food processor and add water. Blend for a few more seconds, until a dough forms. Scoop dough from food processor and roll into small balls using your hands. Freeze for 20-30 minutes. In a shallow bowl, whisk together melted coconut oil with maple syrup and pumpkin pie spice. 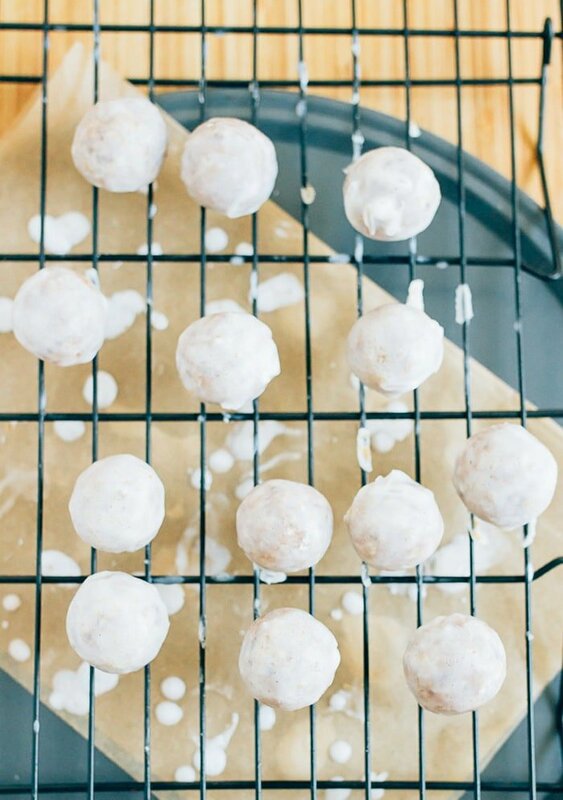 Roll each ball into the coconut oil and maple mixture and place back in the freezer to harden. Continue to coat the donut holes and re-freeze until each donut hole has a gooey coconut maple glaze! We did three rounds of coating and freezing. 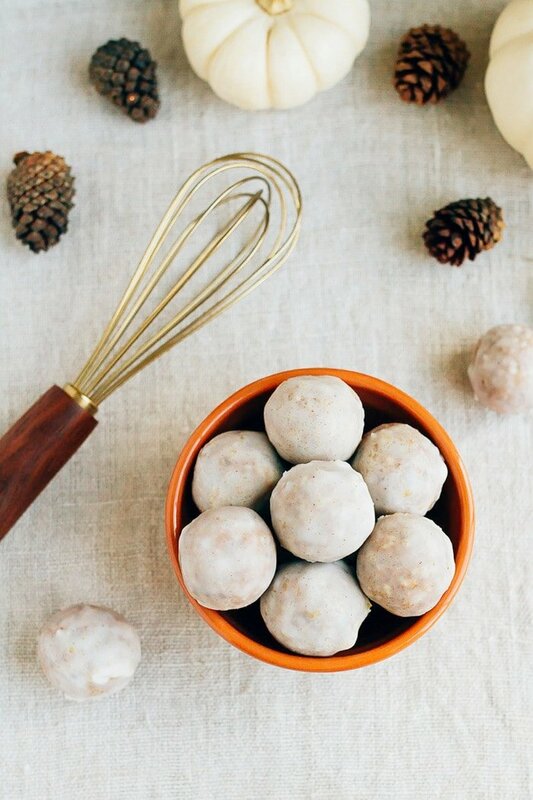 Store donut holes in your refrigerator. Thanks Heather. If you don’t have protein powder you could always just use 1/4 cup oats (so 1/2 cup total) instead! Oh my goodness how perfect are these! These are so adorable! And I know they taste delicious. What kind of protein powder do you use? I can come clean up all your dishes in exchange for half a dozen of these! These sound wonderful and healthy too! And am loving that coconut maple glaze – so cannot wait to try that! Can’t wait to make these this weekend!! You’ll have to let me know how they turn out! I am allergic to cashews, is there a different nut substitute? Could raw almonds or sunflower seeds work? I think raw almonds would work great! I couldn’t get the 5th star to fill in but these are a 5 star treat! I made these today and they were delish!! The glaze really makes them special! Thank you, Brittany, great work! Just made these – huge hit! I swapped the cashews for pecans because that is what I already had on hand. This was my first time using my new(ish) food processor and also my first time using dates and I can’t believe how simple this recipe was. So good – plan to make again using the cashews next time! Yay!! I’m so happy that you loved the donut holes, Josie! And congrats on your new food processor. Are you loving it? Can you substitute the dates with anything?! Please and thank you! I’m a type 1 diabetic. These are delicious! 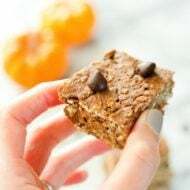 I just made them today and added 1/4 cup pumpkin puree and an additional 1/4 cup oats. YUM!